New research from City University London has shown that using a multi-user virtual world can lead to significant improvements in the everyday communication skills of people with aphasia, a language disorder which can lead to the loss of the ability to speak. Eva Park enables people with aphasia to engage in conversation with support workers in a variety of virtual locations, giving them the opportunity to practise functional and social conversations and gain confidence. Examples include everyday conversations that most of us take for granted, such as ordering food in a restaurant, buying items in a shop or calling the police in an emergency. The results were announced today at an event held at City University London. Funded by The Stroke Association, the City team – which included researchers from the Division of Language and Communication Science and the Centre for Human-Computer Interaction Design (HCID) - carefully created EVA Park from open-source software, guided by the input of five people who have aphasia following left hemisphere stroke. As a result, settings were included that would enable specific scenarios to be practiced, with emphasis on the experience being fun and enjoyable. This also ensured that Eva Park is easily accessible and navigable by people with aphasia, who often have right-sided weakness following a stroke. “Imagine being unable to talk to your family, or even to tell the waiter you want coffee. That’s the daily frustration faced by 367,000 people in the UK living with aphasia. 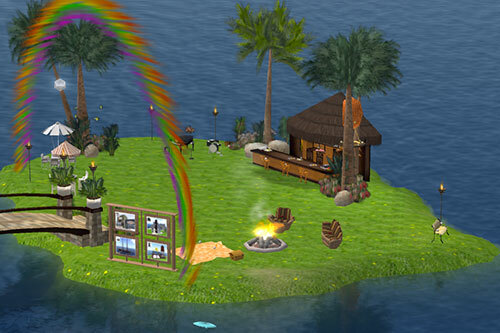 Eva Park is a safe, online virtual world in which people with aphasia can practice their communication skills both with each other and with speech and language therapy support workers. Eva Park offers a range of simulated locations, such as restaurants, bars and a hairdressers, in which users can interact and converse. We have undertaken a trial of EVA Park which showed that it is easy to use, fun and highly valued by participants. There were also some significant benefits for everyday communication skills." Many people with aphasia commonly receive insufficient treatment because health services are overstretched. This is a major problem since aphasia can lead to unemployment, depression and social isolation. Also, many patients can’t easily attend appointments because of physical disabilities or distance, and there aren’t enough therapists to visit everyone at home. One of the participants in the study, said: “If EVA Park wasn’t there I wouldn’t be doing what I do, talk to everyone, going out as well. Went to club on my own 2 weeks ago. Never done that before." The project is a finalist in the Tech4Good Awards, which celebrates innovation in technology that makes the world a better place. You can vote for Eva Park here.